The February job numbers are just the latest economic indicator to defy expectations. Statistics Canada reports the labour market generated nearly 56,000 new jobs last month, all of them full-time. That is well above expert forecasts for flat job growth following an extraordinary report in January. February’s result combined with the 67,000 jobs created in January give the economy its best two-month start to the year since 1981. The February report contains some good news for the housing market. It shows an acceleration in earnings, with year-over-year wage growth coming in at 2.3% – up from 1.8% in January. There is also a boost in youth employment with nearly 29,000 more people between the ages of 15 and 24 finding work. Both of these factors are positive signs for the first-time buyers’ market. 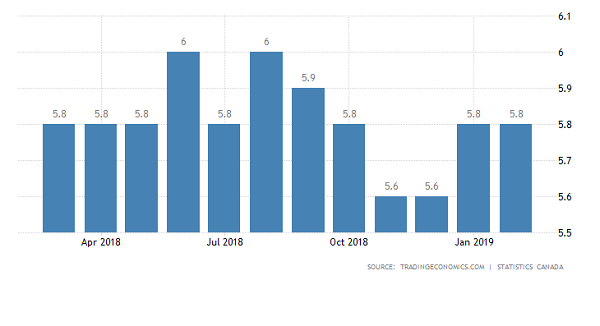 More broadly the unemployment rate remained steady at 5.8%, due to an increase in the number of people entering the job market. It can be seen as good news, in that more people now have the confidence to go looking for work. The February job numbers will likely keep the Bank of Canada on the sidelines. The job increases seem to indicate the economy will resume growth later this year, making a rate cut unlikely. The current slowdown – which also caught the experts off guard – has the central bank holding its benchmark rate at 1.75%. The bank has also dropped language about rate increases from its latest monetary policy statement.